so insanely fantastic. i think this is my ALLLLL TIME favorite. LOVEEEEEEEE! How did you do the pyramid so well? I taped off a triangle shape on my nail, then lightly dabbed on a holographic polish around the edges to get a clean line and some fading to the center. you're amazing! :) great job, you are my inspiration for my blog! Oh. My. God. I want you to have my babies. These are absolutely gorgeous and very well executed. I'm not even kidding, this is the greatest manicure ever. I'd it okay if I post this to my instagram and link it to this site? Do you have an instagram? You may post my pictures to you Instagram ONLY if you credit my blog and Instagram name in the original caption of the photo. If you've already posted it and didn't do so, please repost it with the information. My Instagram name is blognailedit. That's fine! Thanks for asking! So awesome! They turned out great! OMG you blew mine so far outta the water. Now I REALLY need to try again!! This really is so awesome. I am going to have to try it! These are awesome! Great job!! Wow! How did you know I loved Pink Floyd! haha But seriously, Great Job! Blog follower #1400 here! I found your site after seeing these pictures on Facebook today. LOVE your nail art and honest reviews. So happy that you gave your honest opinion about the Jamberry nail shields. I was considering hosting a party but after reading your review (and a few others after reading the comments) I decided against it. Happy to be your latest follower on here and Facebook. 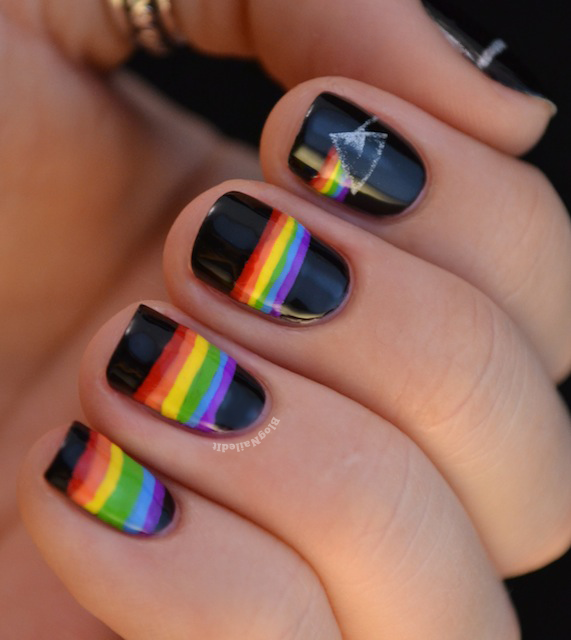 Love Pink Floyd and your nails! This mani is AWESOME!! Wow, I love it! Wow! Truly beautiful. Thank you for sharing this with us. I love Pink Floyd!